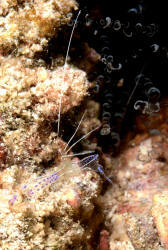 Periclimenes cf. imperator. Indo-West and Central Pacific. To 2 cm. Found on large seastars, nudibranchs and sea cucumbers. 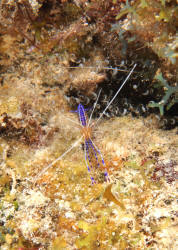 N. Sulawesi images. 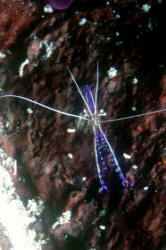 Periclimenes koroensis Bruce 1977. 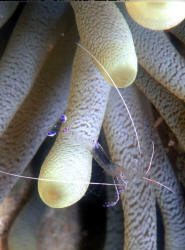 Small, but with a conspicuous white head, long chelipeds... antennae, abdomen often hidden in hosts tentacles (mushrooms, anemones). Western Pacific; Philippines, Australia, Marshall Islands. To 4 cm. N. Sulawesi pix in a Euphylliid. 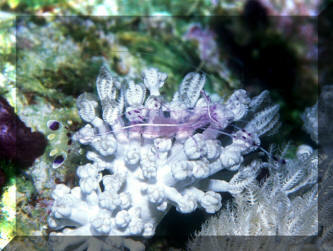 Periclimenes longicarpus Red Sea, Arabian Sea endemic. 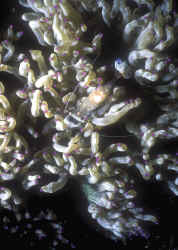 Usually associated with the Bubble Tip Anemone, Entacmaea quadricolor, here on a Bubble Coral, Plerogyra sinuosa and another just off of its anemone (Gyrostoma helianthus) host, resting on an adjacent Xeniid. 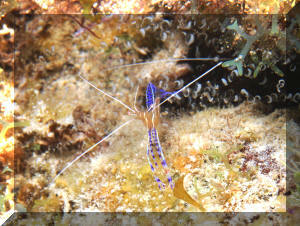 There are at least 45 species of commensal shrimps of the subfamily Pontiinae in the Red Sea. 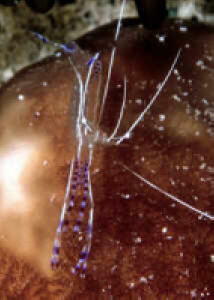 Periclimenes magnificus Bruce 1979. 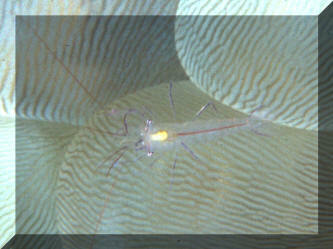 Transparent bodies with four white bands that are made up of white and red dots. Chelipeds, antennae white, legs reddish. 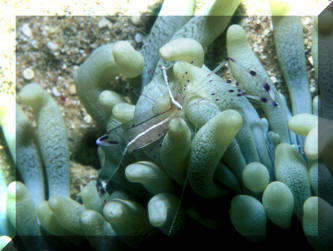 Reportedly found on Elegance Coral/Catalaphyllia and the anemone Dolfleina armata. 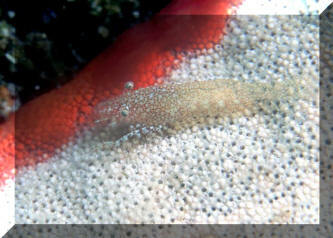 In N. Sulawesi, found on mud bottoms, in association with Snake Eel species... shown. 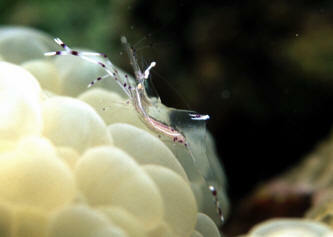 Periclimenes psamathe. 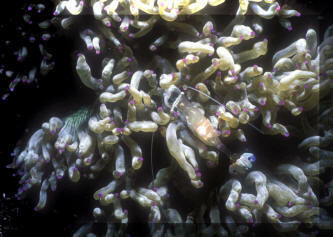 Tropical Indo-Pacific on black corals, gorgonians, hydroids, anemones and Corallimorphs. To two cm. 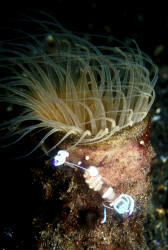 N. Sulawesi (Lembeh Strait) image. 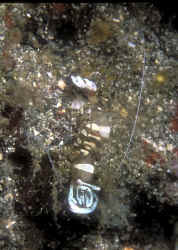 Clear bodied with red lines on abdomen. Periclimenes soror Nobili 1904. Similar, but thinner than P. imperator. 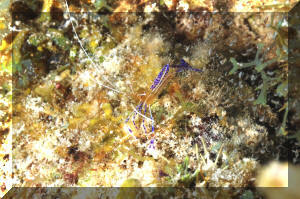 Color, markings matching host... Blue on Linckia stars... Found on other stars: Culcita, Acanthaster, Choriaster. Indo-trans-Pacific; Red Sea, East Africa to Hawai'i, Sea of Cortez. Fiji, N. Sulawesi pix... on Culcita and Choriaster.